Re-reading The Intelligent Investor by Benjamin Graham. His most famous protege is of course, one Warren Buffett. Thought it will be apt as the market undergoes volatility to pick the brains of one of the best investors minds. "The intelligent investor realizes that stocks become more risky, not less, as their prices rise—and less risky, not more, as their prices fall. The intelligent investor dreads a bull market, since it makes stocks more costly to buy. And conversely (so long as you keep enough cash on hand to meet your spending needs), you should welcome a bear market, since it puts stocks back on sale." Very often we wonder whether we are paid fairly in our careers and jobs. So if you are wondering whether what you are earning is higher or lower compared to your peers, benchmarks and salary guides are always useful. How much does a fresh law graduate earn in Singapore? So how much does a new lawyer earn in Singapore? And the difference in pay or salary between graduating from the law schools of NUS and SMU? Overall, regional sentiment was down 2 points to 26, dragged lower by Indonesia where sentiment dropped 14 points to 50, Malaysia which fell 8 points to 47, and Hong Kong which declined 5 points to -10. "Retail investor sentiment is readily affected by factors that hurt their hip pocket and that impacts the employment and economic outlook. Investors in Indonesia were spooked by the lifting of the fuel price subsidy and associated inflation pressures, and Malaysia, being a net oil exporter, was hit by the collapse in oil prices. We expect oil to sink below US$40 a barrel and to stay low for about six months and this will continue to be a headwind for Malaysia's economy," says Megan Greene, Chief Economist, Manulife Asset Management. Hong Kong sank further on investors' gloomy opinion of the real estate market -- with investment property falling a further 9 points to -36 -- due to high property prices and the prospect of interest rate increases given the US dollar peg. Less of a factor was Occupy Central, which only two in five Hong Kong investors said influenced their investment decisions. The index declines were offset by a jump in Mainland China, where jubilant investors pushed the local index up 14 points to 29. The surge was driven by confidence in equity markets, with sentiment climbing 29 points to 58; reflecting retail investors' confidence due to lower interest rates, the strong lending environment and further liberalization of capital markets. Japan was another riser, with sentiment up 4 points to 12, driven by the government's stimulus spending and Prime Minister Abe's December election victory which renewed his mandate for structural reform. "An oversupply of everything from oil to liquidity drove markets and investor sentiment in late 2014," says Greene. "In 2015, big macro-economic events will continue to loom large in markets. China will continue to benefit from targeted monetary and fiscal stimulus, but will see its growth decelerate moderately to around 7 percent in 2015. When it comes to Japan we see very sluggish growth. The weaker yen has failed to boost exports due to competitiveness problems, so the outlook really hinges on deep structural reform." Retail investors across Asia are expecting on average, to achieve returns of 10 percent in 2015. At the low end of the range is Japan with hopes of 7.4 percent, while Indonesia sits at the top at 14.5 percent. Investors in Mainland China sit near the middle, expecting 11.4 percent, a mere fraction of the year-end 37 percent spike in the Shanghai Composite Index. When asked which asset class investors expected to be a top performer in 2015, equities ranked on top (23 percent of investors). Property followed (20 percent of investors), but was especially backed in markets like Indonesia and the Philippines where equities are not a common investment. Region-wide, cash was placed equal second (also 20 percent of investors). 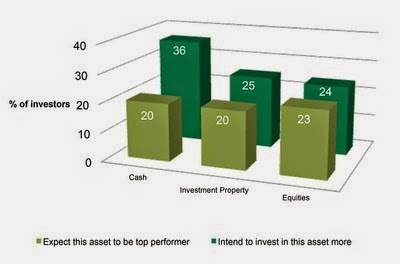 Closer inspection of what Asian investors intend to invest in over the next six months, however, raises questions over their ability to meet their performance targets, as cash remains the most-favored asset class and the top destination for increased allocation. This is despite the fact that Asians are already overweight cash, at 37 percent of their portfolios (excluding primary residence) by usual asset allocation standards. Commenting on investors' optimistic expectations amid the prevailing market volatility, Peter Warnes, Head of Portfolio Solutions Group, International at Manulife Asset Management said, "Many individuals are finding it difficult to plan for the long term in the prevailing market context, but we feel that retreating to cash is not the solution, especially when the low interest environment means that cash won't yield returns." The exceptions to the prevailing preference for cash are China, Hong Kong and Japan where investors held neutral to negative views on cash in the fourth quarter. A smaller percentage of investors in these markets also say they will 'invest' more in cash in the next six months: Hong Kong (27 percent), China (17 percent) and Japan (12 percent). By contrast, investors in these markets are most bullish on equities, with sentiment towards stocks in China at 58 points, Japan at 37 points and Hong Kong at 11. "A multi-asset investment solution can provide investors with a degree of insulation from unexpected market events, while also potentially generating returns in excess of cash or even delivering a recurring income stream," continued Mr. Warnes. "A multi-asset portfolio comprises a mix of equities and bonds and a diversified exposure to a range of markets. We currently favor equities over bonds and within Asia we prefer North Asian markets such as Mainland China and Korea over their ASEAN peers. However, an efficiently managed multi-asset solution can quickly shift asset class or geographical exposure should market conditions change". For more information on the Manulife Investor Sentiment Index in Asia, please visit www.manulife-asia.com. This material, intended for the exclusive use by the recipients who are allowable to receive this document under the applicable laws and regulations of the relevant jurisdictions, was produced by and the opinions expressed are those of Manulife Asset Management as of January 2015 and are subject to change based on market and other conditions. The information and/or analysis contained in this material have been compiled or arrived at from sources believed to be reliable but Manulife Asset Management does not make any representation as to their accuracy, correctness, usefulness or completeness and does not accept liability for any loss arising from the use hereof or the information and/or analysis contained herein. The information in this document, including statements concerning financial market trends, are based on current market conditions, which will fluctuate and may be superseded by subsequent market events or for other reasons. Manulife Asset Management disclaims any responsibility to update such information. Neither Manulife Asset Management or its affiliates, nor any of their directors, officers or employees shall assume any liability or responsibility for any direct or indirect loss or damage or any other consequence of any person acting or not acting in reliance on the information contained herein. All overviews and commentary are intended to be general in nature and for current interest. While helpful, these overviews are no substitute for professional tax, investment or legal advice. Clients should seek professional advice for their particular situation. Neither Manulife Financial, Manulife Asset Management™, nor any of their affiliates or representatives is providing tax, investment or legal advice. Past performance does not guarantee future results. This material was prepared solely for informational purposes, does not constitute an offer or an invitation by or on behalf of Manulife Asset Management to any person to buy or sell any security and is no indication of trading intent in any fund or account managed by Manulife Asset Management. No investment strategy or risk management technique can guarantee returns or eliminate risk in any market environment. Unless otherwise specified, all data is sourced from Manulife Asset Management. Issued in Hong Kong by Manulife and Manulife Asset Management. Manulife is a leading Canada-based financial services group with principal operations in Asia, Canada and the United States. Clients look to Manulife for strong, reliable, trustworthy and forward-thinking solutions for their most significant financial decisions. Our international network of employees, agents and distribution partners offers financial protection and wealth management products and services to millions of clients. We also provide asset management services to institutional customers. Funds under management by Manulife and its subsidiaries were approximately C$637 billion (US$597 billion) as at June 30, 2014. Our group of companies operates as Manulife in Canada and Asia and primarily as John Hancock in the United States. Manulife Asset Management is the global asset management arm of Manulife, providing comprehensive asset management solutions for institutional investors and investment funds in key markets around the world. This investment expertise extends across a broad range of public and private asset classes, as well as asset allocation solutions. As at 30 September 2014, assets under management for Manulife Asset Management were approximately US$276 billion. Manulife Asset Management’s public markets units have investment expertise across a broad range of asset classes including public equity and fixed income, and asset allocation strategies. Offices with full investment capabilities are located in the United States, Canada, the United Kingdom, Japan, Hong Kong, Singapore, Taiwan, Indonesia, Thailand, Vietnam, Malaysia, and the Philippines. In addition, Manulife Asset Management has a joint venture asset management business in China, Manulife TEDA. The public markets units of Manulife Asset Management also provide investment management services to affiliates' retail clients through product offerings of Manulife and John Hancock. John Hancock Asset Management and Declaration Management and Research are units of Manulife Asset Management. Additional information about Manulife Asset Management may be found at ManulifeAM.com. NUS vs NTU vs SMU – Which university’s business degree fresh graduate earns more? Among NUS, NTU and SMU, which university's business graduates get paid more fresh out of school?